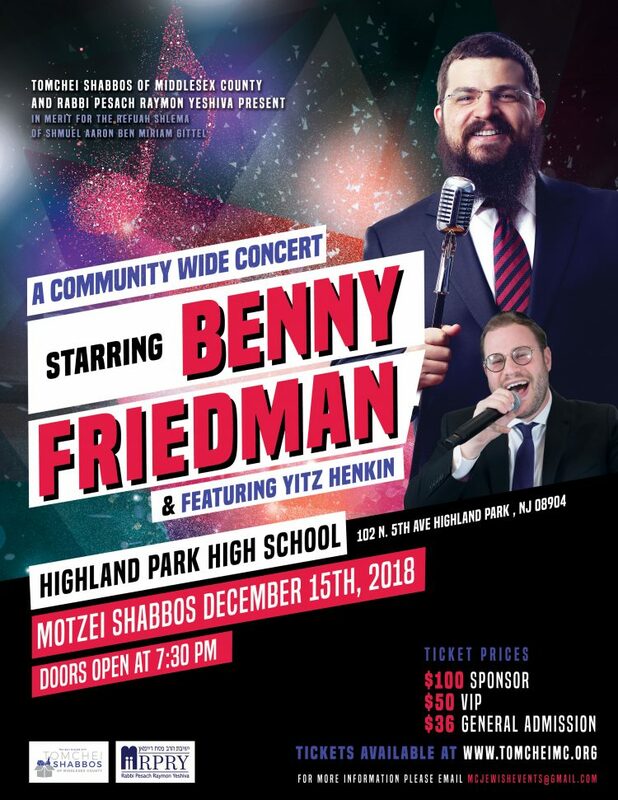 HIGHLAND PARK–American Jewish Singer, Benny Friedman will take the stage to raise awareness and funds for Tomchei Shabbos of Middlesex County and Rabbi Pesach Raymon Yeshiva (RPRY). Benny Friedman will headline the show, with a special performance by Yitz Henkin. The concert will take place at Highland Park High School on North Fifth Ave in Highland Park, NJ on Saturday night, December 15 and doors open at 7:30pm. All proceeds for the concert will benefit the many families who receive much needed food through Tomchei Shabbos and RPRY. Friedman is a Hasidic Jewish Singer who is popular in the contemporary Jewish music scene. Some of his most popular songs are: Ivri Anochi and Yesh Tikvah. Singing mainly in Hebrew, Friedman tours extensively and also appears in music videos. He views his music as an outreach tool, with the goal of drawing Jews closer to Judaism. Yitz Henkin is an American/Brazilian citizen and has led the davening for many shuls in both North and South America. He began singing in choirs and concerts from a very young age and has since trained with the leading instructors in both Israel and America. This is the first time Tomchei Shabbos of Middlesex County and RPRY have had done this kind of fundraising, and judging from pre-sales, it may be an event to be repeated annually. Tomchei Shabbos of Middlesex County has been providing Shabbos and Yom Tov food packages to needy families in the Highland Park, Edison and East Brunswick communities since 2009. We help ensure that, even in difficult times, every family in our community has food to put on their table each Shabbos and Yom Tov. Rabbi Pesach Raymon Yeshiva has been a cornerstone institution in the Edison/Highland Park community for the past 70 years. From nursery through 8th grade, the school embraces the role of providing an education of excellence, in both limudei kodesh and limudei chol, to all families who want it for their children. The educational experience provided recognizes the whole child, and by attending to our students’ social, emotional, behavioral and spiritual development, their academic growth is enhanced as well.